We were planning to (and did) take a trip to the beach in October. It was a 13 hour drive for my family. Yes, there are beaches closer to us than that, but none that would also allow my parents to come. So, we compromised and proceeded to pack and then drive. And drive. And drive. It is on such long trips – without a DVD player or DSI or anything else of the kind – that you begin to long for something to entertain your children. It is on such trips that you realize without a doubt the value of something without pixels that demands your child’s attention. Activity Bags are just what the name says. Activities in a bag! Developed by Sherri MacLean, these bags are designed to be created by an adult and then performed by a child with minimal adult help or supervision. (Please note that there is a warning on all the bags I put together that state “This activity may contain small parts and is not intended for children under 3 years of age. Supervision is required. Plastic bag may pose a suffocation hazard if placed over the head.”) They were created for ages Preschool and up – and yes, you will enjoy doing some of the activities, too! 😉 The idea is to have everything needed for the activity enclosed in the bag so there is never a need to gather supplies. Your little one can just pick up a bag and go to work. Each bag costs about a dollar to make (sometimes a little more, sometimes a little less). Each bag teaches a valuable skill to your child. For example, matching, alphabetical order, numerical order, sorting or patterning. 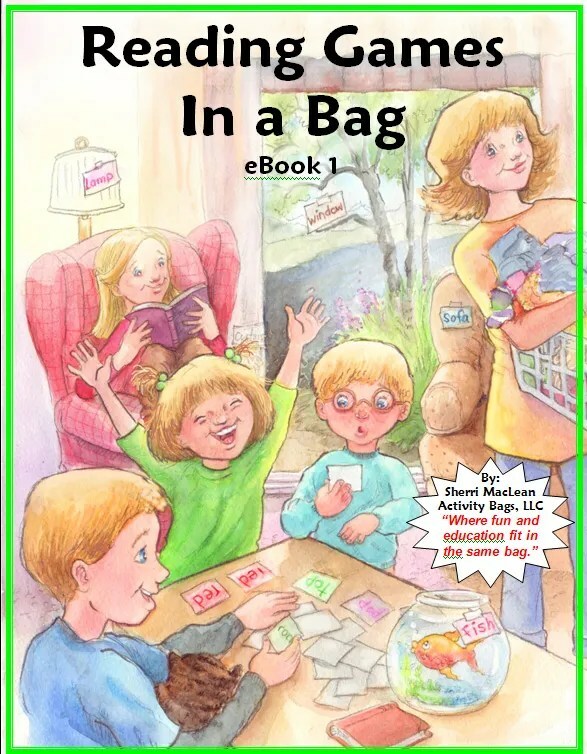 The books come to you in PDF format so you must have access to a printer to be able to make the activity bags. 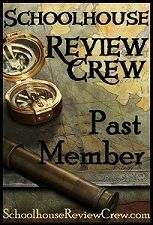 I was selected to review Reading Games in a Bag and Travel Games in a Binder. Reading Games in a Bag consisted of 20 reading activities. Each activity included a targeted area of learning, list of supplies needed, instructions for assembly, a label for the bag, and master copies to create the activity. I had to supply things like card stock in various colors, sandwich bags, gallon plastic bags, small paper cups, unpopped popcorn, plastic page protectors, contact paper, pennies, dry erase markers, felt, and paper lunch sacks. The areas of learning covered the following: eye tracking, word recognition, listening skills, letter sounds, sound recognition, memorization, and separating words. At first, I must admit, I was a little overwhelmed with making the activities. The PDFs were incredibly long and had lots of directions – or so I thought. After I got started I realized that a lot of the words were duplicated (like a whole page of the same label, just printed four times). They did this so that moms can organize a swap. This works well with a group of moms who all want activity bags but don’t want to make them all. You assign a single mom the responsibility of making up the same one or two bags over and over – cuts down on the direction reading – for everyone participating in the swap. At the end of a certain time period, the swap coordinator divides up the pre-constructed bags so that every mom has one of each bag. After I realized that the directions were set up for swaps, too, it became a little less daunting. I used the Reading Bags on my beginning reader (7 year old). Of course, some of the games like charades and bingo needed more than one player, but his siblings were willing helpers. His favorite games would probably be labeling the body parts, making up silly sentences, and charades. He didn’t care for the word recognition flash card games as much but I think it was because they were more difficult for him. He also really liked labeling the parts of a room (which is technically word recognition, but we won’t tell him). Travel Games in a Binder was a huge hit at my house. The kids (ages 7, 9, & 11) even wanted to use the binder when we weren’t on the road! Success! All the travel activities were printed and then went immediately into sheet protectors. (One note on this, if you have a choice when purchasing the sheet protectors, get the heavy duty ones as is suggested in the directions. I accidentally picked up a pack of each regular and heavy duty and the heavy duty worked much better with all the erasing that occurred.) Then I supplied the kids with a dry erase marker and they went to town. There were mazes, counting cows, drawing faces, and some multi-player games like tic-tac-toe, road side bingo, and hangman. My kids honestly liked the ones that didn’t have to be done in the car the best. They really enjoyed drawing silly faces and the mazes the most. I found this strange because those are activities they either have access to at home (mazes) or can do on any piece of paper (faces). However, those seemed to be the hits of the book! The ones they liked the least were the interactive ones where you needed more than one player. Maybe they didn’t want to share the book? My opinion? We really enjoyed the bags and binder after we got them made. It was a lot of printing, so be prepared with extra ink just in case you’re running low. Nothing worse than getting stuck in the middle of a print job! (That may or may not have happened to us.) I recommend both of the products I tried but for completely different reasons. The binder I loved because it was so compact and easy to use on a daily basis no matter where we were. The bags were more bulky and had to have a special place in our house designated for them but they were a wonderful asset to our current reading program. Try them out for free (see below) to get a feel for what you’re getting. There’s so much that can be done with just a simple bag – the possibilities are nearly limitless! Both the Travel Games in a Binder and the Reading Games in a Bag are available for $15 each. A great way to see if Activity Bags are right for your family is to review their website, sign up for the mailing list, and fill out a survey. (Check out the top of the home page for more information. 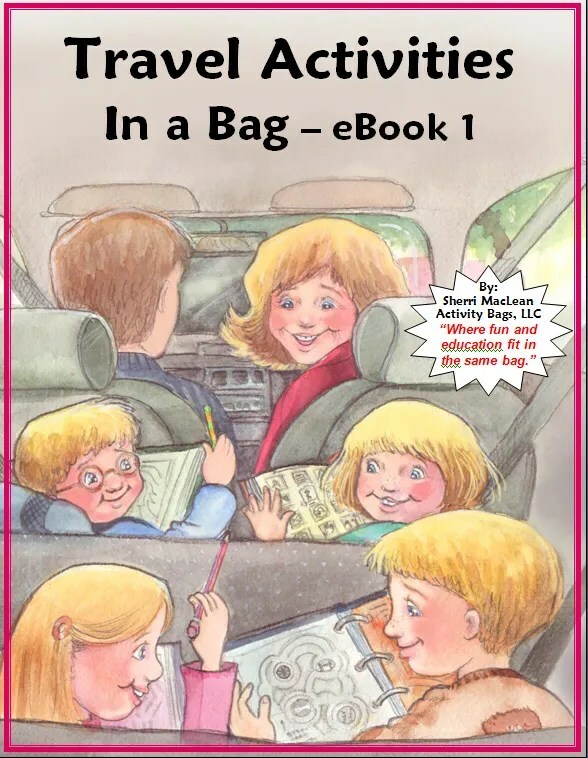 )You will receive an e-book sampler this way and can make and test out the bags on your children. DISCLAIMER: As a member of the Schoolhouse Review Crew, I received a complimentary copy of Reading Games in a Bag and Travel Activities in a Binder for the purpose of completing this review. All the opinions expressed here are my own and are offered honestly in exchange for the product. The receipt of the product in no way influenced my honest assessment.